As the weather starts to warm up, I begin to feel human again and I get excited to switch up my skincare and makeup routine! 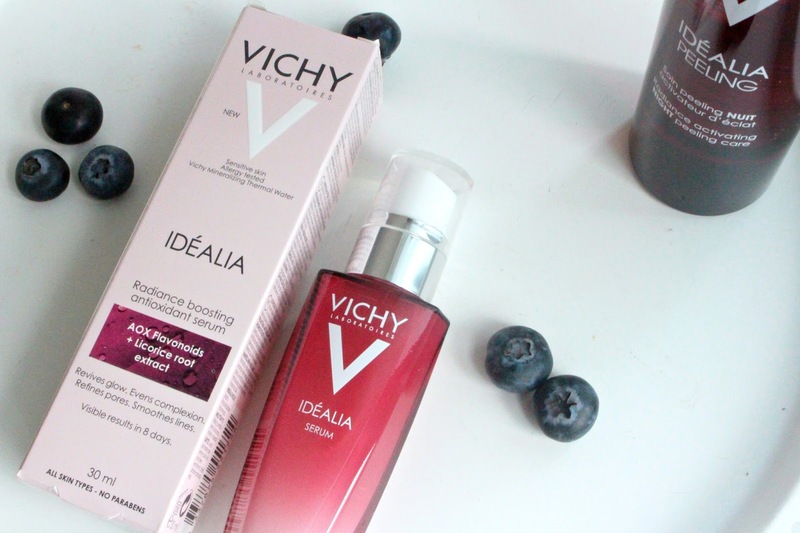 My skin has really taken a hit this past winter, it has been incredibly dry in the air and I have been incredibly busy.To help with my new goals of glowy spring skin I've been reaching for the Vichy Idealia line. See my Spring Makeup Routine that features this line on my YouTube Channel. It's so important to take care of your skin, it's so easy to get caught up in the latest and greatest colour correctors or beaming highlights. When you have a good base, your makeup will look that much better. I feel like it's a common misconception that makeup is only there to completely cover up or change your face - but to me, it is about enhancing what is already there. My best makeup days are also my best skin days. The Vichy Idelia Night Peeling Care is step 1 of this process. It retails for $39.95 with 100mL of product and is available on vishyusa.com or amazon.com. Unlike many peels, this is suitable for sensitive skin and is hypoallergenic. It's paraben free and gentle enough for daily use. The Vichy Night Peel has been formulated with glycolic acid and extracts of fermented black tea and blueberry Polyphenols to enhance your skin's glow. Even though it's great for sensitive skin, that does not make it ineffective, the included ingredients help with evening skin tone, smoothing wrinkles and refining skin texture. "This liquid essence reveals a radiant and more even looking complexion, a smoother feeling surface, a velvety touch. Night after night, upon awakening, skin gets its natural glow back." I'm not sure if it's the drier winter, or my skin is changing but I have noticed more texture than normal. It really makes a difference in the way my foundation applies. 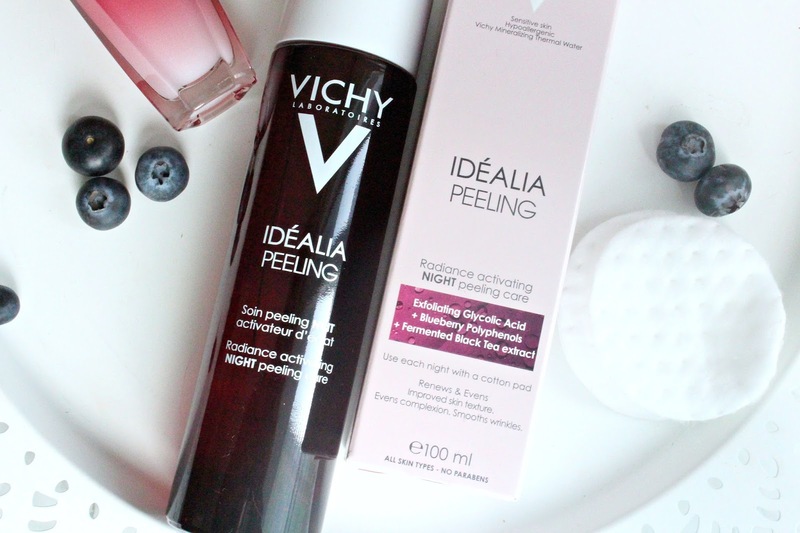 I've been loving using the Vichy Idealia Night Peel as a part of my night time skincare routine. It does not sting or tingle on application, just has a light texture, slightly thicker than water - no distinct scent either. Immediately my skin felt refreshed and clean and the next day it felt softer. Now that I have been using it for a few weeks I can see my skin texture becoming more smooth and glowy. The Vichy Idealia Radiance Boosting Serum retails for $39 with 30mL of product and is available at vichyusa.com, amazon.com and Walgreens. This serum is best for those who are concerned about the dullness or unevenness of their skintone. It's formulated with antioxidants such as licorice root extract and citrus flavonoids to help your skin glow. There is also hyloronic acid and glycerin to help refine lines, pores and supply hydration. This serum includes no parabens, has been allergy tested and is suitable for sensitive skin. "Vichy’s Radiance Boosting Face Serum helps recharge skin’s radiance with antioxidants. Immediately after application, skin complexion looks fresher and brighter with a rosy glow. In just 8 days, skin complexion looks more even, skin texture is refined, and pores seem less visible." As an oily skinned girl, I need to be careful when it comes to serums and moisturizers to ensure that nothing is too heavy on my skin and leaves me looking oily. I've spent the majority of my life using products that strip my skin so I'm trying to add products into my routine that help to hydrate my skin to ensure it is not dehydrated and creating more fine lines. The Vichy Idealia Serum has totally surprised me, it is incredibly lightweight, absorbs into my skin fast but leaves it feeling hydrated and smooth to the touch. Makes a great base under makeup as well which is always a plus. Overall, I think this line is great! I highly recommend it for those of you who have oily or acne prone skin. I think it could work for other skintypes but the light texture is perfect for not overloading your skin while helping it stay glowy, moisturized and clear. This post is sponsored by Vichy USA. All opinions are my own. Find the Vichy Idealia line here.